Join us for an evening of screening and conversation with Verica Kovacevska and Lisa Sigal. The talk will center on Kovacevska's three recent projects. Titled Future Nomads, Master Plan (Children’s Edition), and The House We Grew Up In. Each work focuses on the polemics of gentrification from multiple perspectives— activist, futurist, and autobiographical. Together the artists will discuss the socio-political, historical, and personal traumas sustained by those affected by the urban planning policies that brought about the development. The event is organized by 17ESSEX in collaboration with Residency Unlimited. 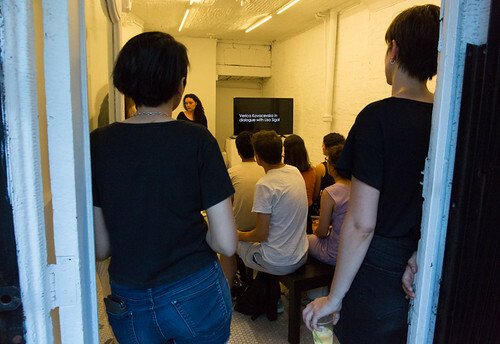 Kovacevska is currently an artist in residence from July through August 2018, where she is researching the rapid changes in her (temporary) Brooklyn neighborhood. 1985 and an MFA from the Yale School of Art in 1989. Sigal is a founding artist/activist of Blights Out a coalition of people generating art, dialogue and action around the issues of blight, housing affordability and gentrification and in support of housing as a human right. We are grateful to 17ESSEX for co-organizing and hosting this event. Verica Kovacevska's residency is made possible with support from The Trust for Mutual Understanding.